Do we really want the coal industry to teach renewable energy to our children? 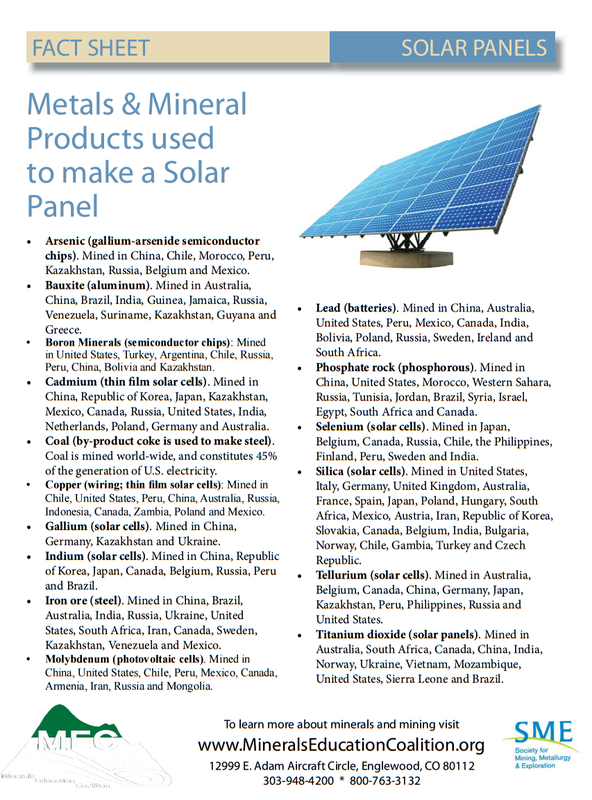 So, here is a "fact sheet" titled "Metals & Mineral Products used to make a Solar Panel." If you know something about how solar panels are made, you can have a good laugh at reading this list. Without going into the details, let me just mention that they manage to list at least one element (lead) which is NOT used in any kind of solar panels, while they completely miss the only rare metal that IS actually used in standard silicon solar cells: silver. And, if you know something about sputtering and thin films, read their "interesting facts" about molybdenum at page 2. That will give you a good feeling of what the acronym ROFLMAO means. Apart from the plain mistakes, the trouble with this list is that it gives the impression that "a solar panel" would have to contain ALL these minerals, whereas most of them are used only for special application and the. All this makes the depletion of rare metals look like a fundamental problem for solar energy; there has to be a reason why I am continuously confronting people telling me that solar panels use rare earths or some other rare and exhaustible mineral. This is exactly the kind of confusion that obscures the fact that, in order to make a solar panel, all you need is aluminum and silicon, a little silver (not strictly necessary) and traces of boron and phosphorous. The Minerals Education Coalition’s (MEC) mission is to identify, produce and disseminate fact-based K-12 minerals education lessons and activities and to inform and educate the general public about the importance of mining in their everyday lives. Another challenge facing coal, and other mining sectors as well, are government efforts in the United States and other countries to combat climate change. We have already seen significant impacts on mining. In the November 2014 issue of Mining Engineering, John Marsden’s column on climate change stirred up some debate. We all know that climate change has natural causes, but human activities can contribute to the change. This issue is a major challenge to not only the mining industry, but to the public that we serve because now it is primarily a political issue. Regardless of one’s position on the issue of climate change, its causes or its consequences, the reality is the movement to reduce emissions linked to climate change is growing in the United States and in other countries. I agree with John’s analysis and reiterate that regardless of the accuracy of climate change predictions, SME needs to be part of the conversation so that, we can continue to use our coal resources in a carbon-constrained world. Of course, SME and its members have the right to think to publicly express whatever they like about climate science. But do we really want the mining lobby to create a spinoff dedicated to "educate children?" When did you discover that there is something badly wrong with democracy? For me, it was in 2009. I had been invited to speak at a meeting called "The Festival of Energy;" a thinly disguised public relation stunt for the fossil fuel lobby, designed to show that renewable energy is a cute thing and that, surely, someday in a remote future, it might be really used. At the meeting, I found myself sitting in the audience in a debate about nuclear energy. The year before, Silvio Berlusconi's party, "the people of freedom," had won the national elections. Almost immediately afterward, the new government had announced that Italy was going to return to nuclear energy after a moratorium that had started in 1987, and that four new nuclear plants would be built. So, the debate was supposed to be about that. The experts on the panel were divided between those who were enthusiastically favorable to nuclear energy and those who were mildly favorable. The audience listened in silence, somewhat awed. Then, there came the time for questions and answers. Someone rose up and expressed the opinion that the government should have promoted a national debate before taking a decision on nuclear energy. The answer came from a functionary of the newly elected government and it provided for me a new understanding of the concept of "glee." Wearing an elegant double-breasted suit, this man addressed the person in the audience more or less as a Medieval lord would address one of the peasants of his feud. "My good man," the functionary said, "there will be no national debate on nuclear energy. We have been elected by the people on a program that said that we would have Italy return to nuclear energy and that gives us the authority to do just that. So, we decided to start building the new plants and that's what we will do. There is no need for any debate. At most, the government will explain to the citizens the advantages that they will obtain from nuclear energy." After such a treatment of verbal shock and awe for the audience, the debate veered on irrelevant questions. I thought that I could have risen up and challenged the double-breasted Lord on his rather extreme interpretation of "democracy". But I didn't do that. Maybe someone else did, but I can't say because I left before the end of the debate, in a rather dark mood. In the following period, the government didn't really succeed in forcing a "non-debate" on nuclear energy; but they kept forging onward with their plans; hammering over and over the concept that they were doing what the people had empowered them to do and that no one had the right of stopping them. For sure, the ragtag group of historical relics, Greens and Reds, who tried to oppose them never seemed to very effective. Then the Fukushima disaster came in March 2011, the government was badly defeated in June in a national referendum on nuclear energy, and Berlusconi was forced to resign in November. Possibly it was the result of not having been able to deliver the nuclear promises he had made to some higher powers. What's interesting about this old debate (if we want to call it in this way) is that the double-breasted person at the meeting had lied; just as many of his colleagues had been doing at that time. He had said that the new government had been elected on a program that included a return to nuclear power. Well, I went to check that document and I found that it said nothing like that. The only statement about nuclear energy it contained said, "participating in European research projects on the latest generation nuclear power". Of course, I was not the only one who noticed that. Many other people did, and several of them tried to use this concept in the debate. But the meme didn't stick; it was drowned in the great noise of the national media and the opposition made no attempt of using it. At that time, I was surprised but, rethinking about this story, I think I shouldn't have been. Apparently, in democracy you can get away with anything, especially if it is lies. That's something that you can see very well with the ongoing American presidential elections. 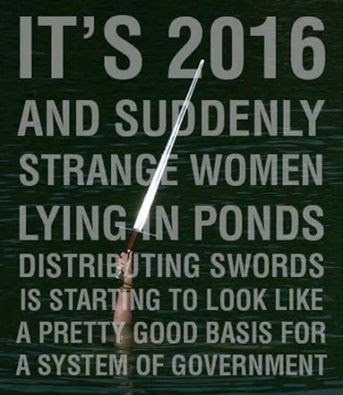 So, maybe it is true that getting swords from women lying in ponds is a better way to choose a government. This is very early as an announcement: don't expect this book to appear before Spring 2017 (and, BTW, the cover above is purely a fantasy of mine). However, I thought that things are advanced enough that I can announce this work in progress. I have signed a contract with Springer for publishing this book in their "Frontiers Collection" and it should appear in Spring 2017. The German edition should appear a little later, published by Oekom Verlag. So, I have been working at full speed on this book all this summer and I can announce to you that, today - actually half an hour ago - I finished it!!! Yes, I arrived at the end of it; 97,000 words in total. I can tell you it was some work. Quite some work! And I looked at everything that I had made, and behold, it was very good! Well, to say that the book is finished is a bit of an exaggeration: as it is, the manuscript requires a lot more refining, retouching, and rearranging. But it has taken a shape, a logic, a form - it is something that says what I wanted to say (more or less) and excludes what I didn't want to say (more or less). So, things are moving onward according to plan. So, what will you be able to read in this book? 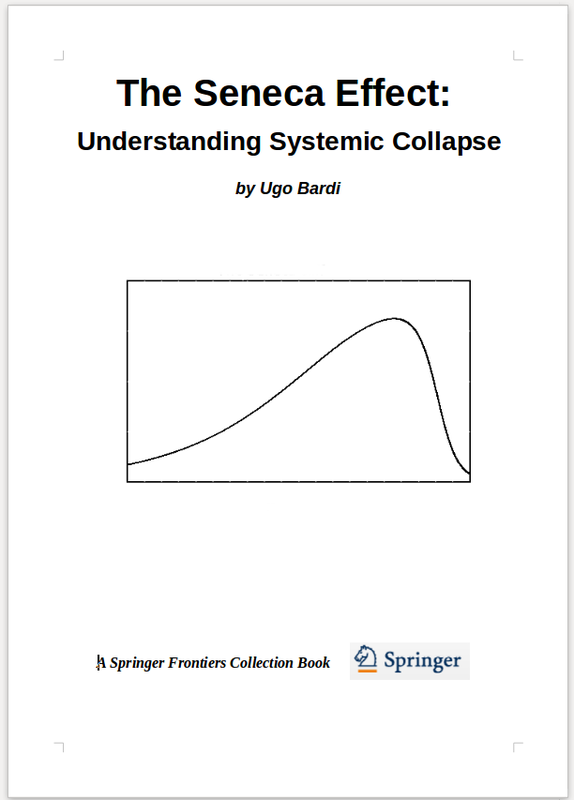 It is a veritable smorgasbord of collapses: you'll read about the mechanics of fracture, the collapse of Egyptian pyramids, about financial collapses, famines, extinctions, the demise of the dinosaurs and - of course - about the fall of the Roman Empire, a favorite subject of mine. 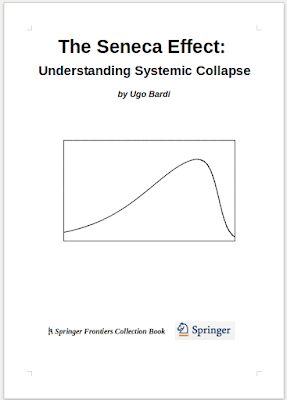 But the book is not just a list of collapses, it deals with the theory behind them: system dynamics, network theory, thermodynamics, entropy and more abstruse things which I am not sure I understand myself. And something about Seneca and Stoic philosophy, of course! 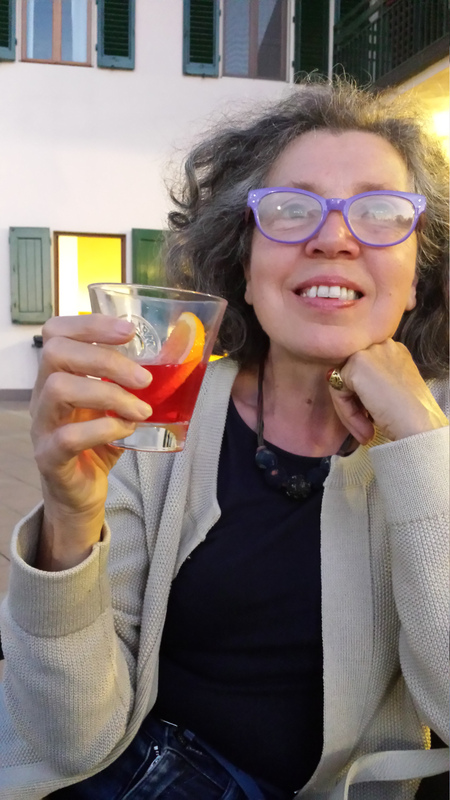 It is also too early for thanking anyone for having helped me with a book still in the making, but I would like to mention how my wife, Grazia, has gently supported me during a summer that was very busy and difficult for me. And we celebrated our 40th marriage anniversary just yesterday! Here she is, in a photo taken for the occasion! Illustration from the paper "The Sower's Way." by Sgouridis, Csala and Bardi recently published in the IOP Environmental Research Letters journal. The main points of the paper are summarized in a previous post. Note how fast the production of energy must fall in order to prevent temperatures from rising above the 2°C limit. 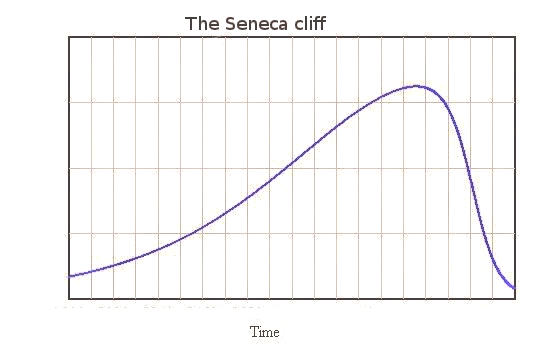 It is a true "Seneca collapse", necessary for the survival of the human civilization. The paper shows that it is possible to control the collapse and to use fossil fuels to produce enough energy to create a 100% renewable infrastructure and at the same time to avoid going over the edge. Everyone is happy about the COP21 agreement in Paris and that there seem to be a certain willingness to avoid to go over the 2°C limit and the probable "tipping point" that will follow. But make no mistake: the task is enormously difficult. Look at these data from "The Global Carbon Project". 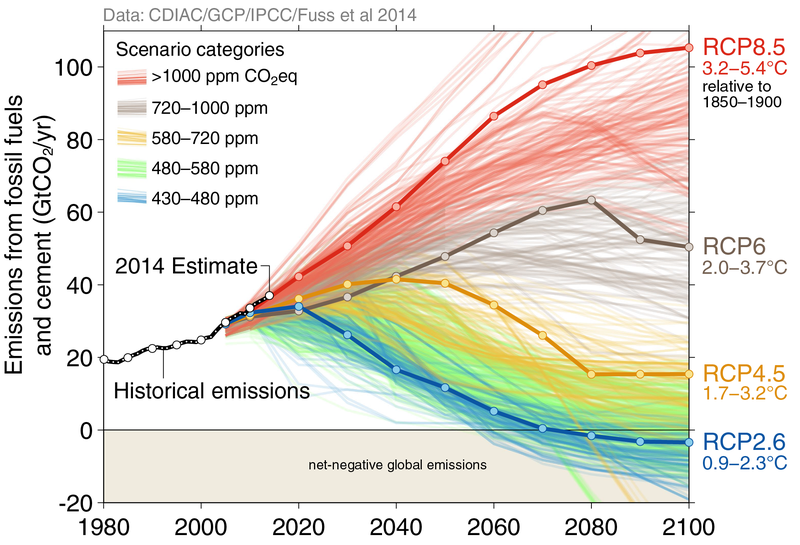 The blue lines are the pathways needed to have a fair chance to remain within the 2°C limit. We have to get to zero from here to 2070, but hoping in a technological miracle that, later on, will make it possible to pump away from the atmosphere some of the CO2 emitted earlier on. Otherwise, we must throttle emissions even faster. No matter which curve you think is most likely, there remains the fact that it took a couple of centuries to arrive to the level of fossil fuel production where we are. Now, we need to go back to zero in a few decades. If this is not a "Seneca Collapse" I don't know what is. 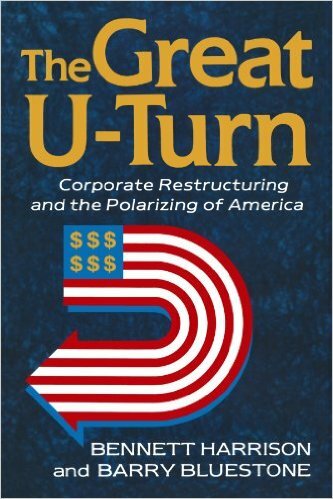 This is a kind of collapse that I describe with the words of the ancient Roman philosopher Lucius Annaeus Seneca "increases are of sluggish growth, but ruin is rapid." So, it is a collapse that we need, and we'll probably have it. Even if governments and institutions fail to act on curbing emissions, it is likely that the fossil industry will collapse by itself because of increasing production costs and sluggish markets - it is happening right now. The problem is that, normally, when something very big collapses, a lot of people get hurt and we would like to avoid that. Is it possible to collapse gracefully and glide down in style along the Seneca cliff? In principle, yes. 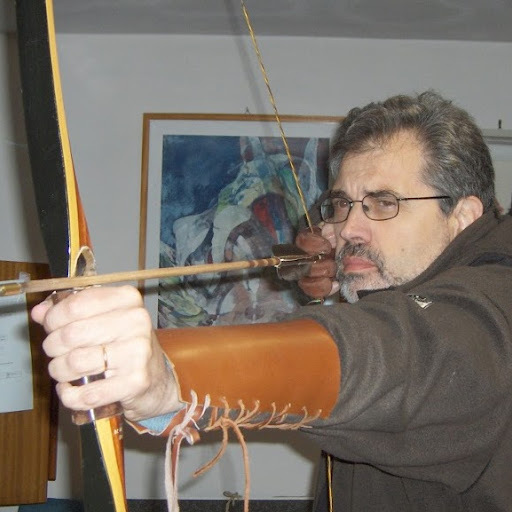 The recent paper by Sgouridis, Csala and Bardi , titled "The Sower's Way." takes inspiration from a strategy well known to ancient farmers, the fact that they had to save something from their current harvest for the next one; it is the origin of the common saying "don't eat your seed corn!" So, the paper reports a quantitative calculation of how much energy we must squeeze out of the remaining fossil fuels reserves in order to build up the renewable energy infrastructure that will smoothly replace the present, fossil based, infrastructure. And how to do that without going over the climate edge. If we can manage that, it will be only the fossil fuel industry that collapses, but not the rest of us. And the calculations show that it is possible. A nice idea, but there is one glitch: it will be very expensive. 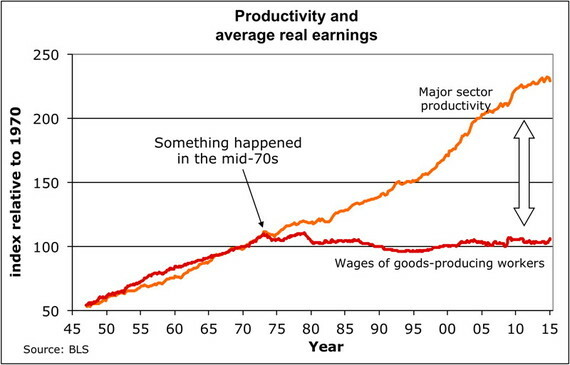 The data show that, if we want this transition, we have to pay for it and to start paying right now. We need to step up investments in a new energy infrastructure of at least an order of magnitude in comparison to the present level. It sounds very difficult, but it is not impossible. Creative collapsing may be the only way to avoid a climate disaster! 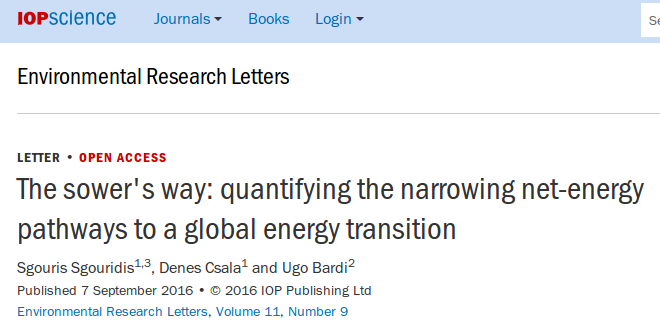 The paper title "The Sower's Way" is open access on IOP Environmental Research Letters. Comments on this blog are welcome. The publication of the paper "The Sower's way: Quantifying the Narrowing Net-Energy Pathways to a Global Energy Transition" by Sgouridis, Csala, and Bardi, has generated some debate on the "Cassandra's Legacy" blog. 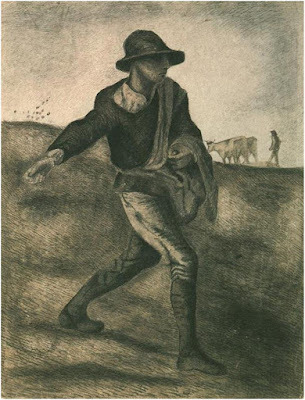 In the paper, we argue that the Sower's strategy consists in using the energy obtained from fossil fuels (the seed of the past harvest) in order to build the renewable energy infrastructure (the next harvest) that will replace the old, fossil infrastructure. In other words, we argue for and we quantify a strategy consisting in not eating one's seed corn. 1. Kummerow: Does it skip past or make a rational assumption about ending growth? That issue deserves more explicit treatment. Growth in global demand (if I missed this in the paper, my apologies, but missing it would mean it needs clearer exposition or more emphasis) at present rates (see my Kaya Identity paper draft) must be something like: population 1.1%+incomes (gdp/capita) 1.7% less -1.4% efficiency (E/Y) gains. That nets to 1.4% or doubling time about 51 years, or say, two doublings in a century. Or, 1,2,4 times more energy in a century. 8,16 in two centuries. I think you need some scenarios with different growth rates. 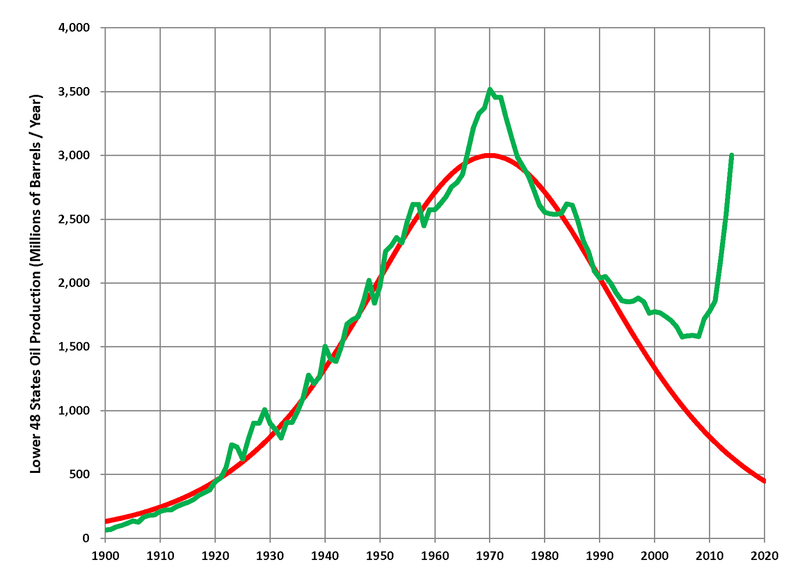 Sgouridis: The paper assumes an end of growth (stabilization) in energy demand per capita. 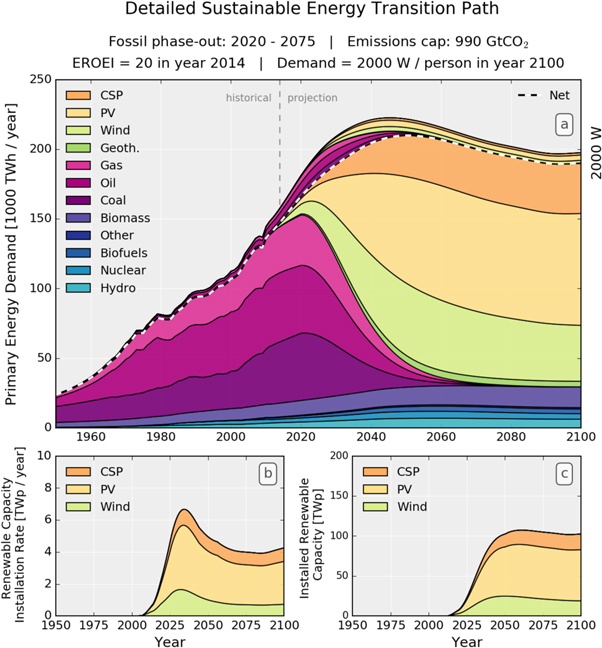 As is also expected/forecasted by the UN to level out, this creates a stabilization in total energy demand. We intentionally and explicitly do not bring into this a discussion on economic figures/GDP. They complicate and divert the issue. What we observe is that in OECD per capita energy demand has been stagnant for a decade or more. 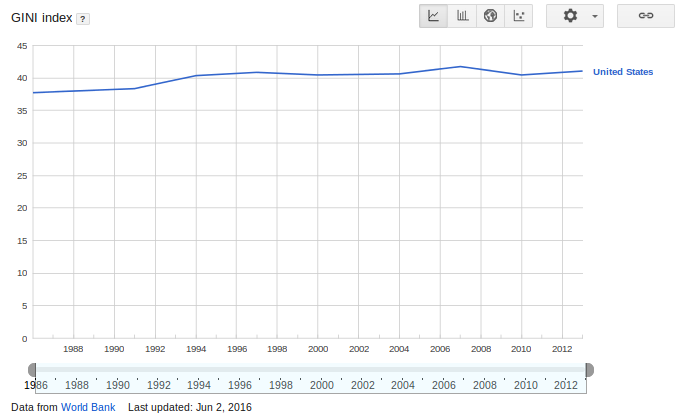 The growth in developing countries is slowing down. It is quite logical to assume that demand for energy to provide a decent life has to eventually converge to a point. It is clear that the world cannot support a US or UAE energy lifestyle for everyone on the planet. We assume that eventually there will be of some kind. The “easy" scenario of 2000W/capita by 2100 reflects a bare minimum (see the Marechal et al 2005 reference). My expectation is that a more reasonable estimate should be around 3000W. 2. And, for the scenario where growth ends, steady state economy, no growth in population or incomes (or energy consumption/capita, almost the same thing), how does demand stabilize? Again, since we do not talk about incomes, for all we care income can increase nominally. It just not imply a growth in energy demand / capita. I agree this is unlikely and those who expect the great decoupling are in for a surprise but the point is demand in the OECD has already stabilized and there is a lot of slack for it to go down. 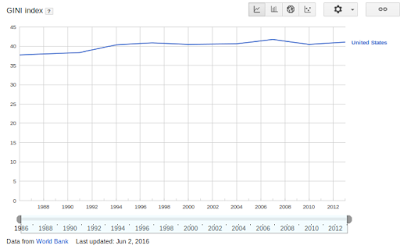 Developing countries can go up by a bit. This convergence means that demand per capita cannot, should not, and need not be expected to grow eternally. 3. I’m sure you are enough of a philosopher and historian to share my worry that the rational paradigm can be overwhelmed by myths. My father, Fred, has been involved in a 60 year controversy about cholesterol and transfats, a place where myths die hard as well. And there are the big ones: religious beliefs. So there are no guarantees that just because science says humanity should do something, that it will get done. The limiting resource (Julian Simon’s insight) is actually human intelligence, or maybe ethics. It’s a very scarce resource right now. I think maybe papers on science should somehow mention the failures of science as a paradigm. The gap between discovery and application is wide in climate science. 4. A "limits to growth" perspective would ask: What becomes limiting when we start building SET? Your paper is about energy limits to SET. What other limits appear? Again, I am sure you know of the planetary boundaries paper by Rockström et al. (2009). "A safe operating space for humanity. Nature", 461(7263), 472–475. GHG the nearest physical constraint but others include our handling of phosphate and the phosphorus cycle in agriculture, pollution especially from hard to crack endocrine disruptors, and a lot more. 5. It is hard to get everything into models because of complexity. Another issue is capital constraints. How many dollars? Definitely an important point. As I mentioned in #1 and #2, we only look at the energy investment not the $ figure of it. Overall energy investment ratios stay below 10% or so for a viable transition. On the capital investment, we can do some rough estimates. According to REN21 we invested 270Billion USD in renewable energy in 2015. This comes down to roughly 2.4$/W. Now since this includes projects that were contracted in the past and projects in regions with high finance costs (e.g. Africa) there is no reason for this cost not to be around 1.5 with today’s technology (the state of the art is 1.4). So with technology advances and scale economies this should go down to around 1$/W by 2035. Since by this time we will need to build a minimum of 6 TW/year, this means an investment of say 6 T$ just for the supply side. For the batteries and long term storage and conversion (Power to liquids) the investment along with the electrification would be at least equal. 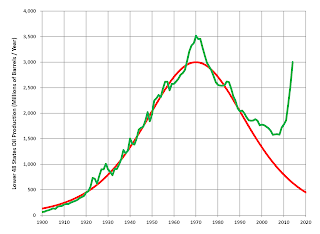 So overall, 12 USD trillion per year at the peak (it will go down after) should be expected. Now we probably spend already in excess of 7 trillion for energy as fuel bills (http://www.leonardo-energy.org/blog/world-energy-expenditures estimates for 2010 are 6.4 trillion) so the order of magnitude is certainly within the realm of what is already happening – it is simply a matter of saner investment. Why waste billions just for buying up land for fracking when you can build RE? This ties in well with my energy credits proposal in #3. This is an interesting question but we have taken the targets as is from the IPCC WGI 2013 report. In my view, they should include the eventual effect of the sulfur aerosols but we need to check this point. 7. The key factor is cumulative carbon. I’m not clear how the graphs in this paper relate to cumulative carbon. As discussed in #6. Cumulative carbon in each of the carbon scenarios stays within the IPCC indicated limit (I.e. 550, 1000, 1500 by 2100). There are no further emissions from fossil fuels. 8. What about technological feasibility? Can steel be made with renewable energy? Can everything be done without fossil fuels? How about making nitrogen, for example? Nitrogen is an easy one – it is abundant and we can get to it either by liquefaction (cryogenic distillation) which is electrically driven or membranes (at lower purities). Hydrogen from electrolysis can be used instead of methane in the Haber-Bosch process. For steel, electric arc furnaces are a direct replacement alternative to CH4 driven ones. There are things that are harder than steel; some large agriculture farming equipment, and ships will need to be supported by either (limited) or power to liquids processes (can be fully renewable). There is a discussion of this but obviously not extensive. 9. Just for curiosity, what is the EROI now and after SET? Lower? You can see the collective EROEI in the graph in the appendix. It more or less stays flat (PV goes keeps going higher, but eventually it drops). 10. Finally, I think population deserves a lot more attention. Countries like Japan, Germany, Italy are headed for big population declines (absent immigration, a big qualification). So maybe the world could reduce population. That is very cheap and feasible, requiring behavior changes and a little investment. Divergent fertility is evolving the world by “cultural selection” (Kaufman, 2010) towards continued population growth. UN 2050 estimates for 2050 have risen by 800 million between 2002 and 2015 revisions. No end of population growth in sight. 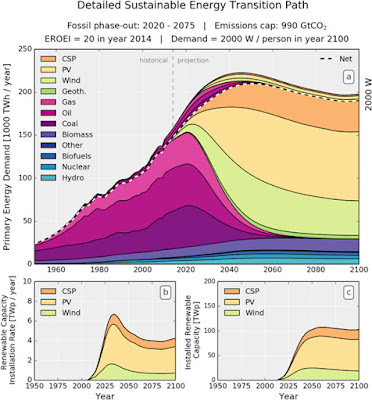 Good points all but also note that UN 2050 estimates fell between the 2010 and 2015 revisions. I think there is a tendency to reach equilibrium but the issue of cultural selection is something that I am not able to discuss. More to chew on. You could expand this paper into a book on LTG of energy. One of the most compelling charts I have ever seen is the “Growing Gap” chart that used to appear in every ASPO Newsletter. This is the one from the last ASPO Newsletter, written by Colin Campbell and published in April 2009. Since then, more than seven years have passed, and peak oil has disappeared from the mainstream press headlines--almost. 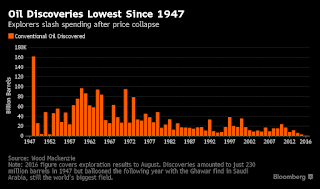 On August 29, Bloomberg published a story alerting to the fact that conventional oil discovery has reached a 70-year low. 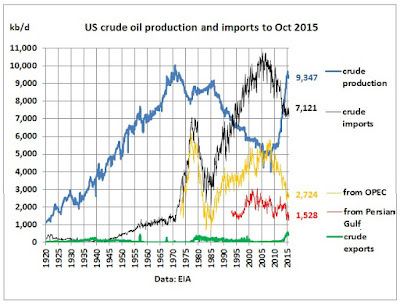 It published a very interesting chart, using data provided by Wood Mackenzie, the oil consulting firm, to show that fact. 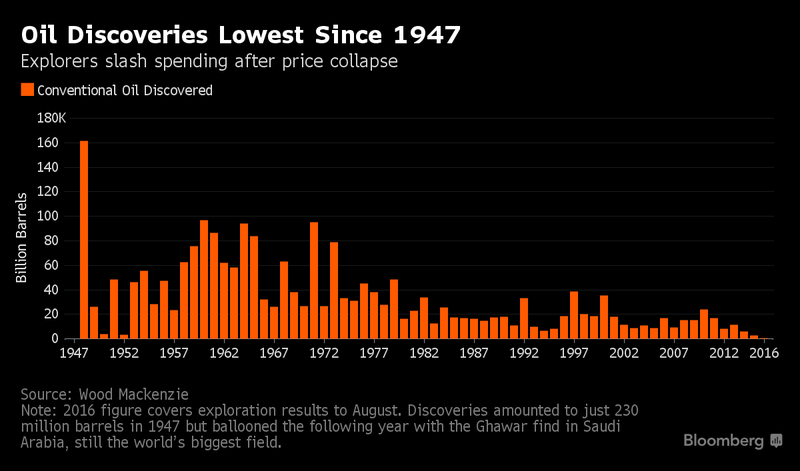 Unlike the ASPO chart, Bloomberg's chart only goes back to 1947, the year before Ghawar was discovered. 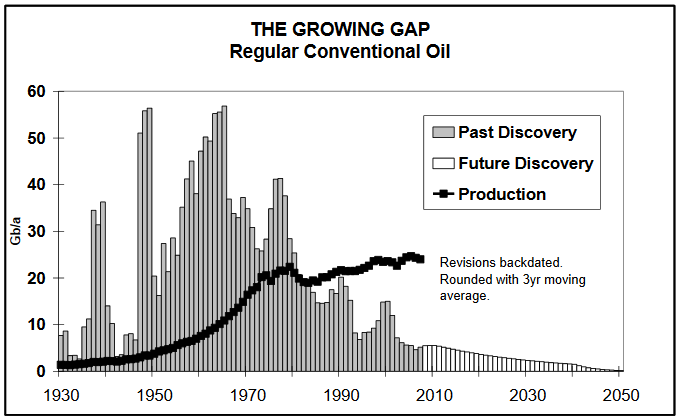 I thought I would reproduce the “Growing Gap” chart using Wood Mackenzie's data. Neither Wood Mackenzie nor Bloomberg make public the data behind the chart, but I used a digitization program, WebPlotDigitizer, to extract data from the chart. The results are not perfect, of course, but give a good enough estimate. One must keep in mind that discovery data are not precise and may have a significant margin of error. 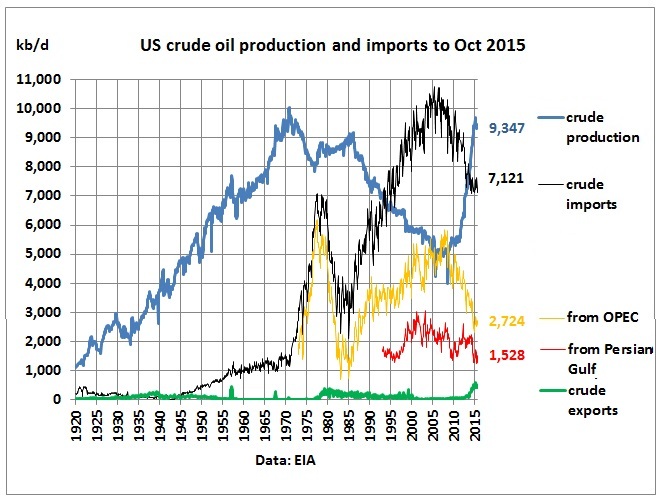 In order to obtain conventional oil production, I subtracted US tight oil production and Canadian tar sands production from the EIA's global crude plus condensate number. I know I must also subtract the extra-heavy production from the Orinoco Belt, but it is hard to find data for it. In any case, this is a very good estimate. 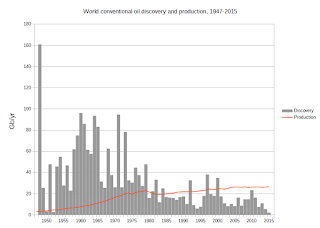 According to data gathered by Jean Laherrère, the Orinoco extra-heavy production is only around 1 Mb/d today. 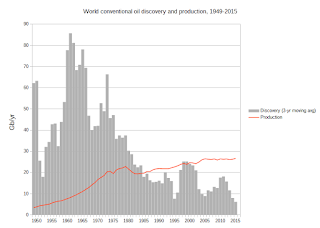 The following chart shows the digitized Wood Mackenzie conventional discovery data and the production data described above. 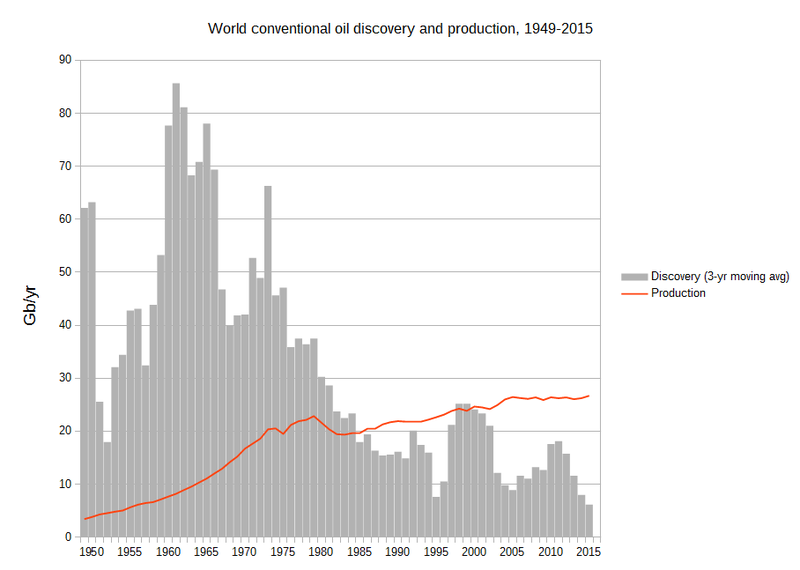 According to the data, since 1980, when the gap between production and discovery began to appear, humanity has extracted about 47 percent more conventional oil than it has discovered. And the following chart shows a three-year moving average of discovery, to replicate the ASPO chart. Notice that discovered volumes are generally larger than Campbell's data, but the drop since 2011 is more precipitous than he anticipated. 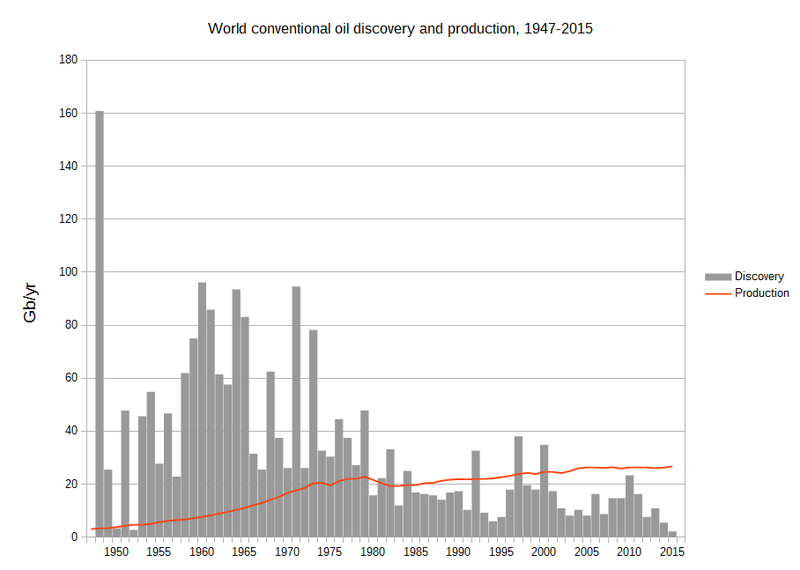 Peak oil by any other name is still peak oil. There is a new and very interesting report on the attitudes of the public on Global Warming. It was published on "Environment" on Aug 26, with the title. 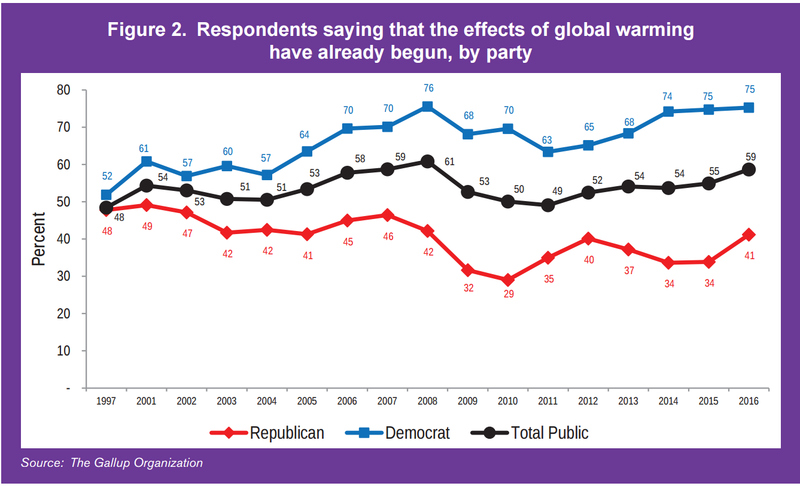 "The Political Divide on Climate Change: Partisan Polarization Widens in the U.S. It is written by Riley E. Dunlap, Aaron M. McCright and Jerrod H. Yarosh. The report provides updated data from Gallup polls that basically confirms some interpretations that I had proposed in earlier posts. We seem to be completely stuck with this debate. The percentage of Americans who agree with the scientific interpretation of global warming today is basically the same as it was 10 years ago. You can see it from the figure above; all the data of the report are consistent on this point. The two camps advance a little and retreat a little, but the front line moves very little. The figure at the top is also interesting because it provides a long-term assessment of what propaganda can do. You see the remarkable dip in the public belief on the importance of global warming that was originated by the "climategate" psyop that raged in 2009-2010. It is something that will be remembered for centuries as a milestone in the history of propaganda. But look at the data: all the climategate sound and fury had some effect only for a few years. And note how it was most effective on the Republicans, that is the people who were already the most skeptical about climate science. On the democrats, the effect is nearly zero. We see here both the power and the limits of propaganda. And it tells us something rather chilling. If we ever were able to mount an important information campaign in favor of science, it could hardly be more effective than Climategate was against science. At best, such a campaign would intensify the belief in good science of those who already believe in good science. The debate is stuck: as we keep preaching to the choir, nothing will change. The reason for this situation is clear from the report - and not just from that. Partisan polarization is increasing in the US and, probably, everywhere in the Western World. And as long as the polarization is so sharp, nothing that can be said by one side will affect the other. And, while we are going nowhere, global warming is marching on.